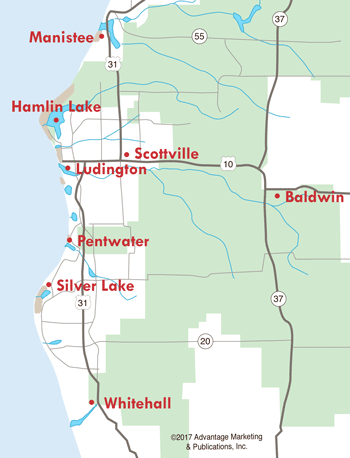 The small town of Arcadia is located in Manistee along M-22, showcasing northwest Michigan's most scenic shoreline. Annually, late in July, the Village population soars with attendees and participants in the annual Arcadia Daze celebration. Events include an arts/crafts show, auto muster, 5k race, kids fishing and games, entertainment, grand parade, and post-parade concert featuring the Scottville Clown Band. Most events are held at Finch Park, unless stated otherwise. 4:30pm - Opening ceremony featuring Arcadia VFW Post. 5pm - Pulled pork sandwiches. 5pm-8pm - Music in the pavilion. 5pm- 1am - Beer tent. 9pm-1am- Live band and dancing ($2 cover charge), Shotman Band. Dusk - Fireworks over Lake Michigan (Saturday raindate). 8am-12pm - Lions Club pancake breakfast, 4th & Oak streets. 8am-12pm - Registration for Auto Muster. 9am - 5k run (registration 7:30-8:45am). 10am - Kids games, Community Center. 10am-2pm - Pie & coffee sale, Township Hall. 10am-4pm - Vendors in the Valley, Community Center. 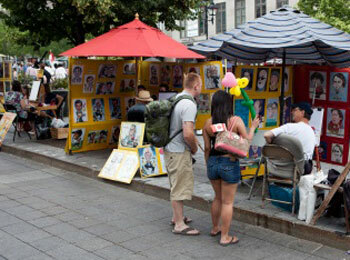 10am-6pm - Arts and crafts show, 4th St.
11am-3pm - Rock Painting, Community Center. 11:30am - Ham & German potato salad lunch, Trinity Lutheran Church. 1pm - Kids fishing, fishing dock 1st & State streets. 2pm - Craft Beer Tasting. 3pm - Auto Muster Awards. 4:30pm - Barbecue chicken dinner. 5pm - Live Music, Feral Cats. 9pm-1am - Band & Dancing High Fidelity. 10am-2:30am - Arts & Crafts, 4th St.
12:30pm - Plymouth Fife & Drum Concert, Finch Park to Marina. 1:30-2:30pm - Gala Parade, Lake St.
2:30pm - Scottville Clown Band Concert.